As the PASP research assistant, one of my tasks this semester was to curate and process material for the Aegean Scholarship collection on Texas ScholarWorks. This is part of PASP’s ongoing mission of making accessible as much of our research materials and resources as possible. 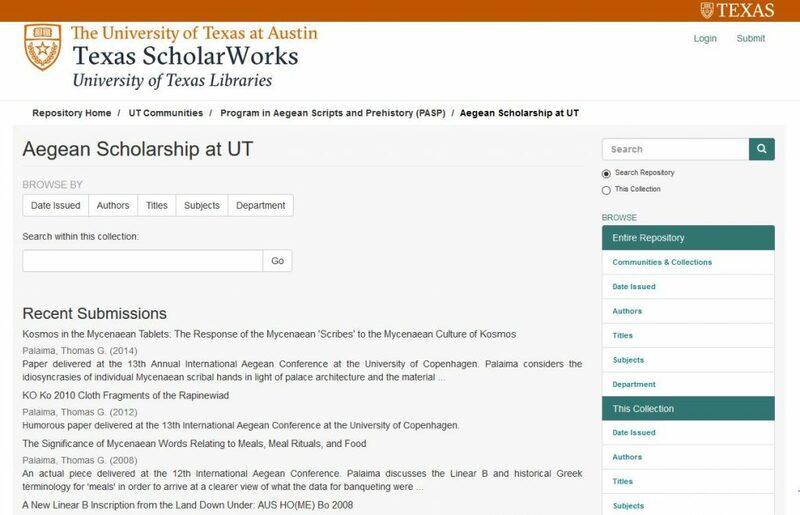 The Aegean Scholarship collection at TSW serves as the digital home for Aegean-related dissertations and theses authored by former PASP students, touching on topics like Minoan religion, Mycenaean archives, and figures of authority in Mycenaean society. The students’ dissertations demonstrates the rigor of scholarship PASP attracts. For instance, Dimitri Nakassis’ 2013 book Individuals and Society in Mycenaean Pylos grew out of his 2005/2006 dissertation entitled “The Individual and the Mycenaean State: Agency and Prosopography in the Linear B Texts from Pylos.” Dr. Nakassis’ work is pivotal in new understandings of Mycenaean palace-states as networks of individuals rather than monolithic blocks. Dr. Nakassis now teaches in the Department of Classics at the University of Colorado at Boulder. TSW’s Aegean Scholarship collection also curates faculty research on the Aegean studies. For now, this consists primarily of the scholarship currently of Thomas Palaima and Cynthia Shelmerdine. The scholarly works of Professor Palaima span his entire UT career and reflect a lifetime of comprehensive and granular research. They consist of a range of articles on a variety of Mycenaean subjects, book reviews, and conference papers. It has been my responsibility to digitally process and make permanently accessible fourteen articles and conference papers Professor Palaima has published in UT publications. They run the gamut from a reappraisal of the last years of the Palace of Nestor at Pylos to humorous pieces delivered at iterations of the Aegean Conference. 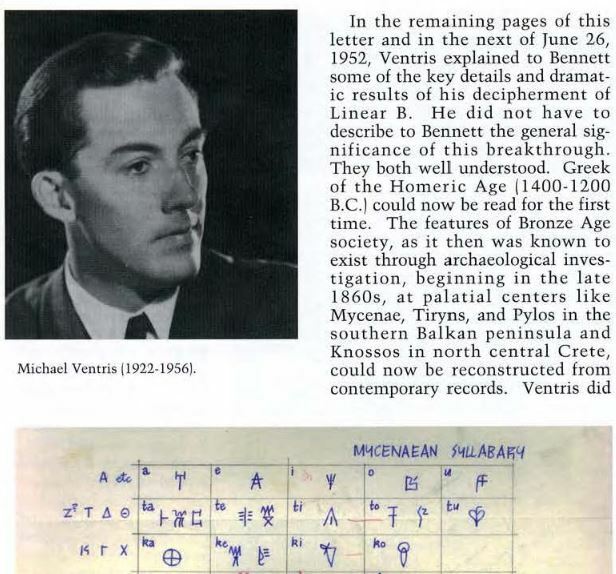 Also online are Palaima’s research into the history of Linear B decipherment, covering individuals like Michael Ventris, Alice Kober, and Emmett Bennett. Like his contributions to the Times Literary Supplement and Austin American-Statesman, these reflect the whole person of Professor Palaima, both learned scholar and jovial concerned citizen. We are in the process of having all former PASP Electronic Theses and Dissertations digitized to TSW, so keep checking back!